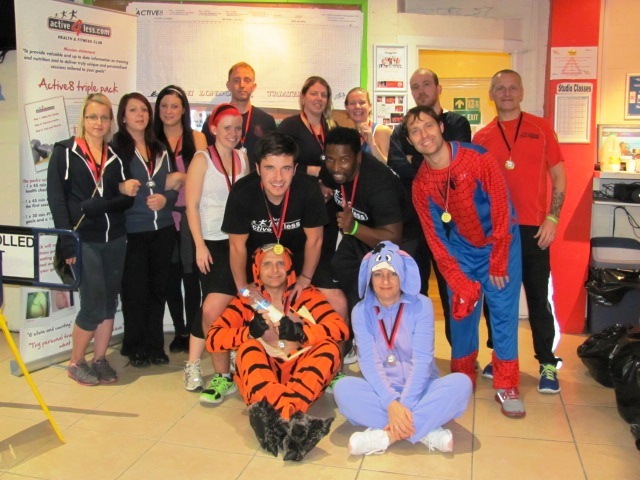 Last Friday, my local gym in Uxbridge organised its fifth annual 'All Night Challenge'. What is the All Night Challenge you ask? Well, in a nutshell, it is twelve hours of running, rowing and cycling until your body can take no more. Twelve hours of blood, sweat and tears across three different exercise machines - and twelve hours to dress up and make fools out of ourselves in the name of charity. This year, my wife and I both participated on behalf of our chosen charity: Cancer Research UK. Approximately 50 people started the gruelling challenge which ran from 8pm at night to 8am the following morning and about half managed to complete it. Some could only manage a few hours due to work and family commitments, some held out until around 3 or 4 o’clock in the morning, but with the help of the local pizza shop - who generously donated ten 12” pizzas topped with cheesy goodness – the rest of us managed to survive the full distance. Though the night I had the opportunity to trade my usual smart business attire (that I am regularly complimented on) and expose the 'quirkier' side of my wardrobe. I went from caveman to Where’s Wally to a bouncing Tigger. If you think that’s an effort, my wife managed to go through five costume changes in the same time slot. The atmosphere on the night was similar to that of a hen or stag do at the local nightclub; people had great fun dressing up, shouting & singing to the pumping tunes of MTV. The medal, the hot shower and of course the money that we raised for a great cause made all of the pain and chafing (oh the chafing!) worthwhile. So far we have raised £600 and this is still rising. A tiring night but well worth it. Will I do it again? Yes, I will - I just need to decide what to wear.